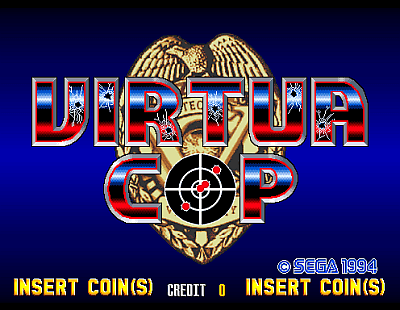 Virtua Cop © 1994 Sega. 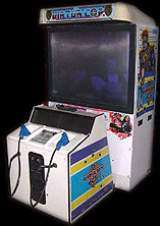 Runs on the Sega "Model 2" hardware. 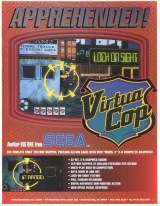 Virtua Cop was released in September 1994 in Japan. Virtua Cop serves 300,000 polygons per second. Sarah Bryant from "Virtua Fighter" appears in stage three... outside the gangster bosses' room is a rotating all-white Sarah Bryant statue. The statue is unbreakable, but the vase it's holding isn't. Toshiba EMI released a 2 CD limited-edition soundtrack album for this game (Virtua Cop Soundtracks - TYCY-5478~9) on 24/01/1996. [JP] Sega Saturn (nov.24, 1995) "Virtua Cop [Model GS-9060]"
[EU] Sega Saturn (dec.8, 1995) "Virtua Cop [Model MK81026-50]"
[US] Sega Saturn (1995) "Virtua Cop [Model 81015]"
[JP] Sony PS2 (aug.15, 2002) "Virtua Cop Re-Birth [Model SLPM-62205]"
[EU] Sony PS2 (nov.29, 2002) "Virtua Cop - Elite Edition [Model SLES-51229]"
[US] PC [MS Windows, CD-ROM] (oct.31, 1996) "Virtua Squad"